Observers in many parts of the world observed the astronomical spectacle. In Hawaii, people watched the event on Tuesday afternoon local time at an observatory of the US National Oceanic and Atmospheric Administration on Mauna Loa, 3,400 meters above sea level. In Sydney, Australia, many people wearing protective glasses cheered when they saw the relatively tiny planet move across the sun. 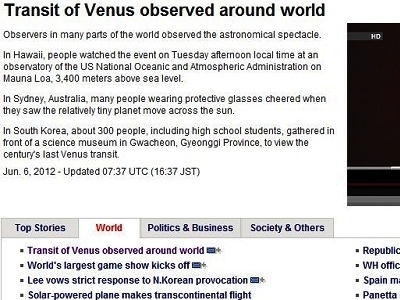 In South Korea, about 300 people, including high school students, gathered in front of a science museum in Gwacheon, Gyeonggi Province, to view the century's last Venus transit.